30/03/2014 · They must exist somewhere other than the Start Screen but I cannot find them. Ultimately I need this data so I can write a vbscript that can pin or unpin the Start Screen shortcuts. Ultimately I need this data so I can write a vbscript that can pin or unpin the Start Screen shortcuts.... As you can see, it just looks like a Windows 8 version of the familiar Start Button, which would have opened the Start Menu in Windows 7 and earlier. This really helps make the Desktop more familiar to users of past version of Windows. When you click the new Start Button, however, you quickly realize you are not in a prior version of Windows. One of the worst changes in Windows 8 is the way it did away with the Start Menu. Want to get it back? It's easy to do. Just follow my directions. 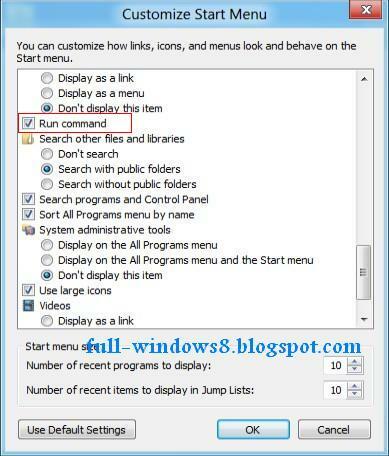 The Start Menu was a fast way to find and launch... 30/04/2013 · Find the programs you need, right click on them and select "pin to start". Go back to the start screen (click left down corner). Your programs should be there as tiles. You can drag and drop them around (up n down, left or right) and move them in categories. Now you are ready to use the desktop the same way you did before and use the start screen as a large start menu. Suppose I want to find MyProgram's icon in new great superior progressive and very charming Microsoft's start menu of Windows 8.1? I press Windows button and this wonderwork appears. As you can see, it just looks like a Windows 8 version of the familiar Start Button, which would have opened the Start Menu in Windows 7 and earlier. This really helps make the Desktop more familiar to users of past version of Windows. When you click the new Start Button, however, you quickly realize you are not in a prior version of Windows. 30/03/2014 · They must exist somewhere other than the Start Screen but I cannot find them. Ultimately I need this data so I can write a vbscript that can pin or unpin the Start Screen shortcuts. Ultimately I need this data so I can write a vbscript that can pin or unpin the Start Screen shortcuts.